Congratulations to Britt Flatmo for her single release - #CONFUSED. Confused is now avail for purchase on iTunes and Apple Music. As well as available to stream on Spotify and YouTube. Excited to announce the release of the official lyric video for 'So in Love with You'. #SILWY is now avail on iTines, Apple Music, Spotify and Youtube. Dallas, TX (August 19, 2016) – Hollywood actress Britt Flatmo will be headlining at the 30th Annual Grapefest on September 17, 2016, 5:15pm on the Gazebo Stage. 19 yr old Flatmo is an award winning actor and singer most known for her starring role in "Life As We Know It" with heavy hitters Katherine Heigl & Josh Duhamel as well as her role in J.J. Abrams’ & Steven Spielberg's blockbuster hit "Super 8". Flatmo released her self-titled freshman album earlier this year, which was produced by 5 time Grammy award-winning producer Devine Evans and Jonathan George. The first single, “Come On Home” gained her a deal with international media moguls, Vega Entertainment, to launch her music globally. The music video stars MTV’s Teen Wolf’s heartthrob Cody Saintgnue, which has given her much attention. In television, Flatmo has had co-star & guest star roles in Without a Trace, Big Time Rush, Medium, Talkshow w/ Spike Feresten as well as starred in Hallmark Channel's Diner Formal. She has also done voice-over work for Disney as well as commercials for Redi Whip and Time Warner Cable. Flatmo is also scheduled to perform as part of the Texas Music Project at Love Field on Friday, September 16. Please check website for full details. Flatmo will be in Dallas September 14 - 19 and will be available for interviews and musical performances. To read more about Britt Flatmo, visit www.BrittFlatmo.com. Congrats to recording artist Dani Rey on her first music video YO! ft. Miguelito MTO! Now available on iTunes, Apple Music, Spotify and Youtube. My girl Karoline Milton shines on the home page of ReverbNation - Crowd Pick of the Week! Become a fan of Karoline! Big shout out to my favorite spit fire Tiffany Stringer for cartwheeling, high kicking and singing her way to securing her golden ticket to #HollywoodWeek! She is someone to keep an eye out for as she moves her way through the next step of her American Idol journey. Congratulations to Lovey James for grabbing her golden ticket to #HollywoodWeek! The growth that Lovey has shown through out the years has been exciting to watch. I can't wait to see how she takes on the American Idol stage next week. Congratulations to Trevor Douglas for snagging his golden ticket to #HollywoodWeek! So proud to have worked with such an amazingly talented artist. He is becoming a real master of his craft. Trevor Douglas - American Idol #IdolAuditions makes his way to Hollywood Week. Fox 4 News Dallas-Fort Worth Good Morning Dallas recognizes Trevor for his accomplishments. 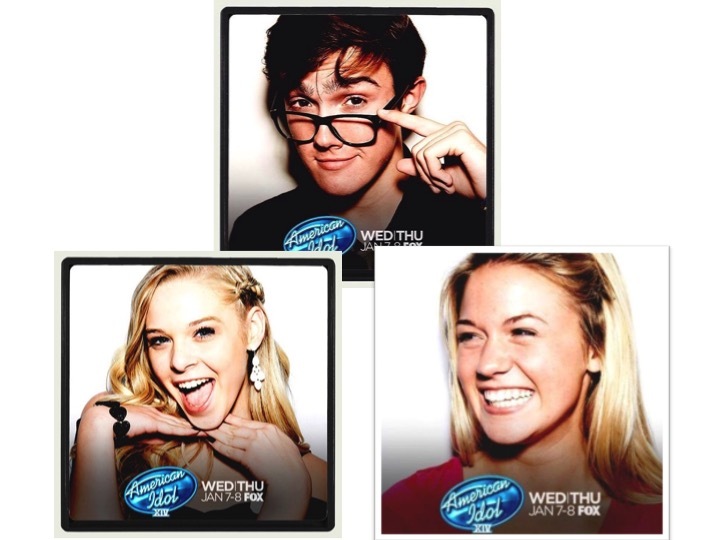 Stay tuned to American Idol on Wednesday and Thursday on Fox. Congratulations to some amazing artists for grabbing a golden ticket to Hollywood Week during #IdolAuditions in Nashville, Kansas City and New Orleans. Become a fan of Trevor here! Become a fan of Lovey here! Become a fan of Tiffany here! 2014 SCV Icon was a HUGE success with amazingly talented singers. Our panel of industry judges had there work cut out for them try to pick the Grand Prize winner and 3 Category Winners on Sunday afternoon at Westfield Valencia Town Center. It was a battle for the top spots but in the end the best competitors prevailed. Thank you to Socal Icon for hosting the event as well as Westfield Valencia Town Center for holding the vocal competition. Big Shout out to our Sponsors: The Rage Entertainment Complex, JG Entertainment, and Hollywood Launch Academy of LA. Special Thank you to Starbucks for suppling our fantastic judges with beverages during the Qualifying Round and Finals. Join us on Sunday, December 7th for a Vocal Performance Workshop hosted by Hollywood Launch Academy and the Rage Entertainment Complex. 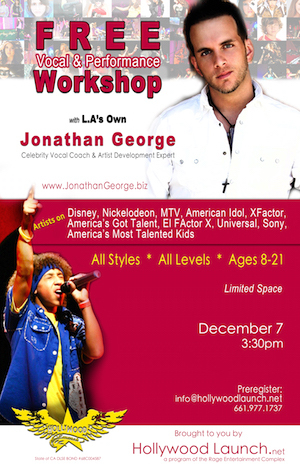 LA's own Jonathan George, celebrity vocal coach and artist development expert will be holding a FREE Vocal and Performance Workshop. He has worked with artists on Disney, Nickelodeon, MTV, American Idol, XFactor, America's Got Talent, El Factor X, Universal, Sony, America's Most Talented Kids, just to name a few. Register TODAY for this amazing opportunity. Email for more info! Industry Showcase with Live Band! JG Entertainment presents Industry Showcase with Live Band starting October 12th! Great Opportunity! Limited Space Available! Email to TODAY for more info! Calling all vocalist! This is your time to shine...The stage has been set and we are ready to get this party started! Some dates, You just can't save featuring brother/sister duo Piper Curda and Major Curda.